Michael Gove today likened hardline Eurosceptics to 'mid-50s swingers' waiting for actress Scarlett Johannson to turn up at a party. The extraordinary barb from the Environment Secretary came as Cabinet met to discuss the prospects of Theresa May's Brexit deal getting through the Commons next week. The PM is scrambling to win over mutinous MPs as she stares down the barrel of a disastrous defeat. But ministers have been going all-out to make clear to critics that killing off the package will not result in their ideal vision of Brexit - as some Tories hope. At Cabinet today, Work and Pensions Secretary Amber Rudd warned that history would take a 'dim view' if the government allowed the UK to leave with no deal, saying the country would be less safe. Ms Rudd insisted politicians had to accept the world 'as we find it, not as we wish it to be'. And she was backed by Mr Gove who compared Brexiteers who are refusing the accept the Withdrawal Agreement - such as Jacob Rees-Mogg - to over-picky swingers who were waiting for the perfect partner to arrive at a party. 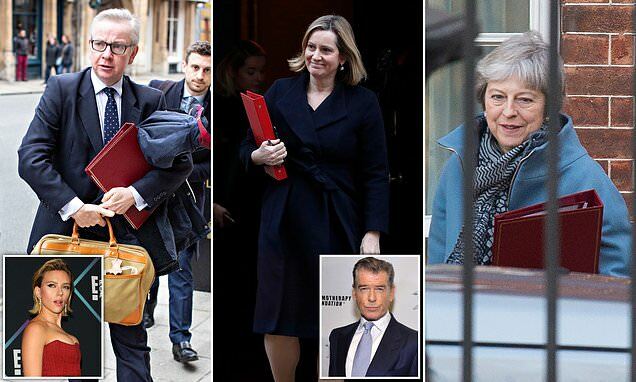 Responding to Mr Gove's reference to the Holywood actress, Ms Rudd quipped that some MPs might be waiting for Pierce Brosnan. Justice Secretary David Gauke, who has condemned wishful thinking by Brexiteers, waded in to say that Labour seemed to be holding out for Scarlett Johannson 'on a unicorn'. Jeremy Corbyn has said he wants the UK to be in a customs union but able to strike trade deals elsewhere - something Brussels has flatly rejected.